These are the beginnings of a pair of Primavera Socks, in Madelinetosh sock in (I think) the ‘violas’ colourway which was one of my Boston purchases back in April. They are an extremely belated birthday gift for friend P (also known as Beatrice the kitty’s regular human). I showed her my basket of sock yarn and she stuck her hand in and went right for this stuff, for the psychedelic greens. It is just the right shade of crazy to be fabulous, and the stripes are working up beautifully in this pattern. This is my first time working with this yarn and so far I think I’m on the side of thumbs-up. It’s thinner than the sock yarns that I’m used to, but it’s also fairly squishy and sproingy, which – and Pam will hate me for saying this, as she has had a pair of Madelinetosh Jaywalkers on the go for, oh, a while – might just make it an ideal combination for the Jaywalker pattern. Move over Lorna’s Laces Shepherd Sock, you’ve got competition for my Jaywalker affection. In other news, I still want to knit approximately eleventy million things, wish it was Rhinebeck weekend right now, and am resentful of the “work” I have to “do” that prevents me from knitting all day while eating chocolate. But at least the knitter in my head is well-occupied, even if my hands can’t be all the time. Happy Tuesday and may your knitting be close by! I LOVE the colorway. It’s just the perfect amount of crazy. I agree with the other Kate (who, please note, isn’t me :-D). I feel as if knitting has escaped my life lately and I need to find it and keep it occupied for a while…. LOVE the colors of the socks. Cute and cheerful! BTW, knitting all day while eating chocolate sounds like the recipe for happiness. I’d need some coffee, too, though. 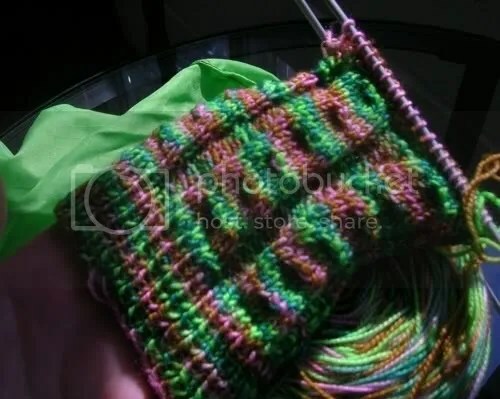 Cute yarn – they look like Mardi Gras socks! (I know, no gold, but still…) Very fun. I’ll try to eat some chocolate for you, okay? Oh what fun colours! A bit of a treat every time you look in your bag and pull those babies out to knit! Lovely colors & thanks for the link to the pattern. I always have my knitting (usually socks) with me so that I can knit whenever as there are so much to knit & so little time. I was just looking at that pattern a day or two ago…maybe I will have to add it to the queue after all! TOTALLY know what you mean about being stranded without the knitting! I love that idea of the “knitter in my head”. Thanks for the link to another pattern that knitter can now play around with! I love that yarn! Beautiful! The socks are gorgeous. I’ve seen that pattern a couple of times and it looks like it’s mindless knitting after a couple of repeats! 🙂 Great bus knitting!! Knitting while eating chocolate sounds like the way to go! Beautiful socks by the way, love that color. I’ve awarded you the arte y pico over on my blog since I love checking out what your knitting.